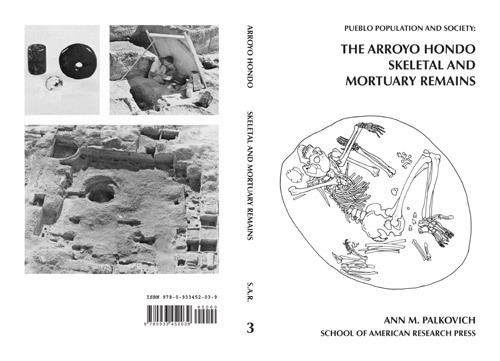 This monograph (1) provides comprehensive data on the skeletal remains and associated mortuary practices found during the excavations at Arroyo Hondo Pueblo; (2) it presents analyses focusing on problems of health and social organization in this prehistoric pueblo; and (3) characterizes Arroyo Hondo Pueblo in the larger social context of fourteenth-century Pueblo occupation in the northern Rio Grande region. One hundred and twenty human skeletons were excavated at Arroyo Hondo Pueblo; many were accompanied by grave goods such as hide blankets, jewelry, and offerings of food. The monograph thoroughly describes, analyzes, and interprets these skeletal and mortuary remains. The analysis led in several interesting directions, including an examination of pathologies in relation to the age distribution of the population, which in turn produced considerations of the impact of malnutrition on the Pueblo’s demographic structure. Palkovich also used mortuary practices to test an ethnographic model of age and status grading derived from Tewa Pueblo culture and speculations concerning the social organization of Arroyo Hondo Pueblo. In an appendix, the Arroyo Hondo mortuary data were compared with information from other contemporaneous pueblos in the northern Rio Grande region in order to examine the possible existence of a regional pattern. This monograph goes far beyond mere description to put life on the bones that were recovered. 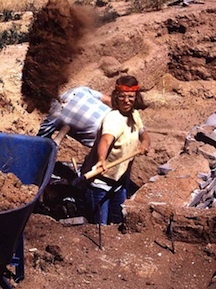 In doing so, Palkovich has made an important contribution to Rio Grande archeology and to the study of physical anthropology of southwestern Native Americans. 1982 Review of Pueblo Population and Society: The Arroyo Hondo Skeletal and Mortuary Remains, by Ann M. Palkovich. American Antiquity 1982: 911-914. 1981 Review of Pueblo Population and Society: The Arroyo Hondo Skeletal and Mortuary Remains, by A. M. Palkovich. American Journal of Physical Anthropology 56: 96-97. 1982 Review of Pueblo Population and Society: The Arroyo Hondo Skeletal and Mortuary Remains, by Ann M. Palkovich. Kiva 47: 178-179. 1981 Review of Pueblo Population and Society: The Arroyo Hondo Skeletal and Mortuary Remains, by Ann M. Palkovich. American Anthropologist 83: 927-929. 1981 Review of Pueblo Population and Society: The Arroyo Hondo Skeletal and Mortuary Remains, by Ann M. Palkovich. The Masterkey 55: 156. 1981 Looking at Books. The Santa Fe New Mexican July 23: D-6 – D-7. 1981 Review of Pueblo Population and Society: The Arroyo Hondo Skeletal and Mortuary Remains, by Ann M. Palkovich. Books of the Southwest June 1981: 6.
Review of Pueblo Population and Society: The Arroyo Hondo Skeletal and Mortuary Remains, by Ann Palkovich. Neues Schriftum: 145.